One of the framed photos of CEF (Canadian Expeditionary Force) soldiers on our wall is labelled "Pte. W. J. P. Bullock" of Toronto Ontario. 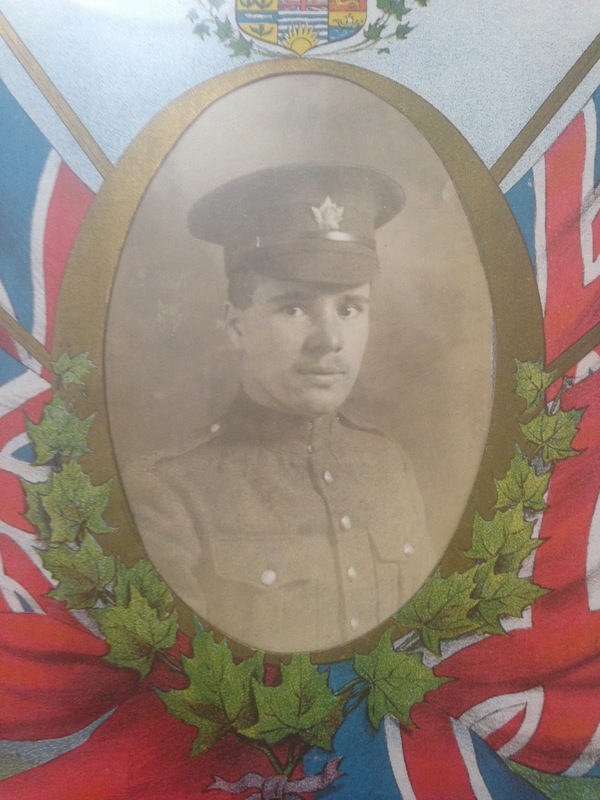 This young man enlisted on September 2, 1915, one year after WW1 began in August 1914. 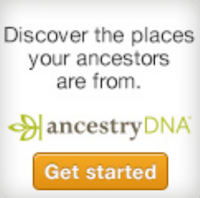 Research on Ancestry.com found more details including his full name - William James Percival Bullock. William was born July 12, 1894 making him just 21 years old when he joined the CEF. His father was listed as Arthur Bullock. Young William was just 5'6" tall but that was a fairly normal height for the times. He is listed as having a fair complexion with brown hair and eyes. Sadly my research revealed that young William was killed almost one year to the day he enlisted. The War Graves Circumstances of Casualty shows him as being buried in Warloy-Baillon Communal Cemetery near Albert, France having died on 4 September 1916. According to the records, William was wounded at Pozieres, taken to South Midland Casualty Clearing Station but died of his wounds the following day. You can see his tombstone here. 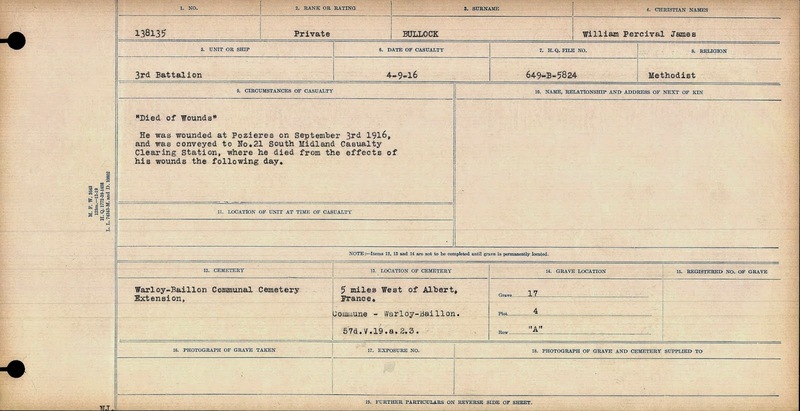 William is found in the 1911 Census for Toronto Ontario with his parents, Arthur and Elizabeth Bullock. He is one of 8 children.His father was born in England, his mother in Ireland. William's older brother, Albert Latimer Bullock, also joined the CEF but he survived the war, returned home and married in 1923. His death occurred many years later in June 1965 in Toronto Ontario. William will be remembered in our home. This is my grandfather's cousin. The soldier's father Albert Ernest Bullock (1867-1940) was the brother of my great grandfather George Bullock (1853-1928) - they were from Stoke on Trent Staffordshire. Albert Ernest has puzzled me for years - he just disappeared after the 1881 census - I now know that he was the only one of 5 brothers to emigrate to Canada in 1884. 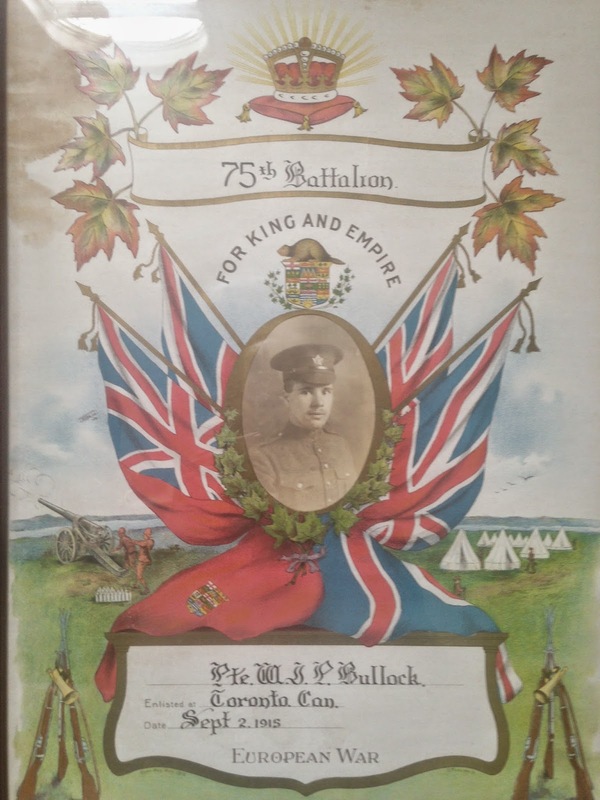 The soldier above was a contemporary of my grandfather Eli Bullock born in 1895. He too served in the army in WW 1 (British Army east Yorkshire Regiment) in France and then Salonika (Greece/Macedonia). He survived the war and lived to 1984.